Huckle isn't felling well and he needs to get his tonsils taken out. He's a little worried about having an operation, but after seeing how brave his friends are, Huckle decides to stay in the hospital. After his operation Huckle feels much better and he's more relaxed. 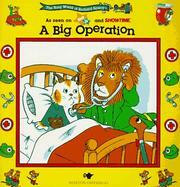 Scarry, Richard, “A big operation,” Children's Picture Book Database at Miami University, accessed April 18, 2019, https://dlp.lib.miamioh.edu/picturebook/items/show/9772.